The nutrition world can be extremely confusing. One day we are told to eat one thing, the next day we are supposed to avoid it. Depending on who you talk to, you get a huge amount of contradictory information. In order to help you separate the truth from the myths, we have compiled a list of the top 10 healthy foods that aren’t so healthy. The majority of nutritionists agree that these foods aren’t doing you any favors. Hopefully it will clear the air and help you to live a healthy life that truly is healthy! How can fruit juices be unhealthy if it comes from fruit?! Well, the sad fact is that most of fruit juices that fill the fridges of families across America have had their nutritional value stripped from them before they are bottled. The skin of the fruit is removed, fiber is extracted, and it has most likely undergone some form of pasteurization to kill the bacteria. The process of pasteurization can also destroy a number of vitamins and minerals that exist in the whole version of the fruit. If you are a fan of fruit, stick to the real thing. It will limit your sugar intake and help you to enjoy the fruit’s full nutritional value. Although whole-wheat foods are definitely better for you than the processed, refined version found in other wheat products, it is not doing your health any favors. Wheat and the flour it’s made with get digested quickly, which can lead to a quick spike in blood sugar. The phytic acid in wheat prevents important minerals from being absorbed properly. Although it has not been proven, studies suggest that wheat has addictive properties. 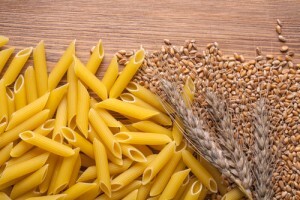 It is thought that those who eat wheat (even whole) tend to develop strong cravings for it. If you insist on eating wheat, always opt for the whole form. However, decreasing your intake will help to speed up the weight loss process and live to a healthier lifestyle. Many people believe that agave is a healthy sugar substitute because it comes from a plant, making it natural. The problem with agave is that although it has a low-glycemic index, it has an insane amount of fructose. In fact, it has more than high-fructose corn syrup! Eating food that is rich in fructose causes your body to limit the amount of insulin it releases. This affects the amount of leptin your body releases. Leptin is a hormone that helps to regulate your appetite. In addition to that, it is believed that fructose is converted to fat more quickly than glucose. In other words, agave can cause you to eat more and also increase the amount of fat on your body (particularly your belly). Avoid agave nectar at all costs. Switch it out for honey, which has less fructose and other nutritional properties! 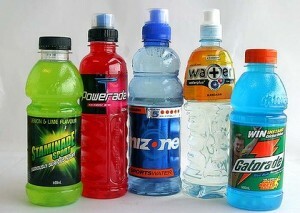 Sports drinks continue to be wildly popular, especially in the United States. Sports drinks can be very effective for athletes or people who are engaging in heavy physical activity. They help to replace electrolytes that are often depleted during exercise. The problem with sports drinks is that many people who drink them do not do it when they are engaging in heavy physical activity. Sports drinks are usually calorically dense or contain potentially harmful artificial sweeteners. Do your best to cut sports drinks out of your daily diet and replace them with water or tea to keep you hydrated and energetic. Just like sports drinks, energy bars are something that shouldn’t be used by people other than athletes or individuals in training. Although there are some that have high nutritional value and are not packed with calories, most aren’t doing you any favors. Many bars are filled with added sugar, high-fructose corn syrup, and saturated fat. If you insist on using energy bars as a snack or meal replacement, make sure they fit into your diet. Click here for a list of the best protein bars on the market, from a nutritional standpoint. Just like many other “reduced-fat” and “fat-free” products on the market, those terms do not always mean that food is better for you than the regular version. 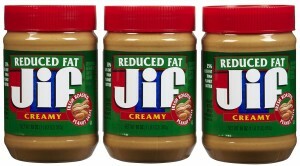 It is true that peanut butter has a high fat content compared to other foods. However, it is high in monounsaturated fats, which are good for you (in moderation). The reduced-fat versions are often filled with other things like starches and sugars, which can be detrimental to your health. By opting for the reduced-fat version, you are depriving yourself of something that helps your body to function properly. Turkey burgers are tricky. Although they are usually a healthier option compared to a ground beef burger, especially in restaurants. Restaurants will often make up for the loss of flavor by replacing it with dark meat and turkey skin, both of which can up the fat and calorie content. In other cases, the amount of sodium is amped up. Try to avoid ordering turkey burgers at restaurants. When you make them at home, always choose turkey that is at least 95% lean. Okay, there are plenty other foods out there that are worse for you than sushi. But many people tend to believe that eating sushi is actually good for you (it is fish, right?). That is not the case. This is true for a number of reasons. Many rice vinegars used in sushi preparation contain a high amount of high-fructose corn syrup. Although not all of them do, that is a gamble you are always taking when you eat sushi at a restaurant. An average sushi roll contains one to two cups of rice. That is nearly 250-500 calories a roll in rice alone! The soy sauce used to dip sushi in is packed with sodium. 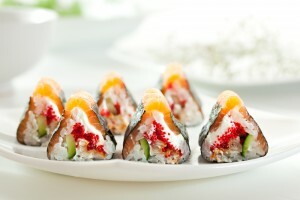 Many sushi rolls contain tempura, which is deep fried batter! So go ahead and enjoy your sushi every once in a while, but avoid making it a staple in your “healthy” diet! Granola is made from oats. Oats are good for you, so granola should be too, right? Wrong. Granola is also made with a large amount of oils and sugars. The oils and sugars greatly increase the calorie content. The average cup of granola has 450 calories with 15-17 grams of sugar per serving. One cup is probably not enough to fill you up, meaning that whenever you snack on granola you are ingesting many more calories than you probably realize. Unflavored, cooked oatmeal is definitely a better option if you just love the taste of oats. We have absolutely nothing against eggs. 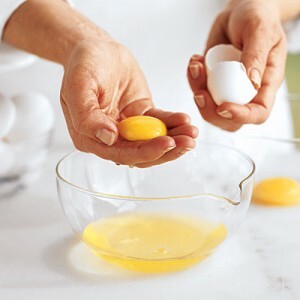 Whole eggs are relatively low in calories, and have a high amount of protein and antioxidants. The trend as of late is to ditch the yolk and enjoy whites of the egg alone. The problem with that is that although you are decreasing calorie intake, you are also depriving yourself of serious nutritional value. True, the egg yolk contains fat. But it is fat that is good for you. In addition to that, you are missing out on protein, choline, vitamin A, folate, and calcium. Keep eating eggs, but eat them in whole form. Your body will thank you for it!